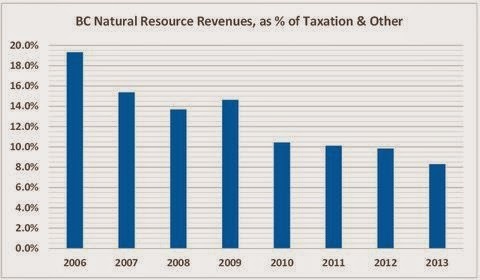 Clearly, government revenues from natural resources have declined substantially in recent years. 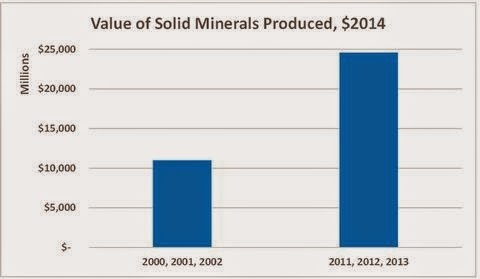 This is in spite of rising metals and minerals prices and growth in production volumes. Here is an example. In any economy, there are winners and losers. Among the winners is Teck Resources Limited. This company, its affiliates and associates have contributed millions of dollars to the BC Liberal Party. It has invested wisely and, as a result, its assets have grown seven fold since the beginning of 2002, from $5 billion to $36 billion. “Clark said [in June 2014] that she knows the benefits, frozen since 2007, are too low. If the priority of government is to subsidize and steadily reduce the obligations of big businesses that exploit provincial assets, the day when social services are more affordable will never come. More money from msp premiums than corprate tax. It amazes this nformation is not front and centre of a loud public debate about taxation and government services. Wake up people. Billions of dollars that once flowed into public hands are now pocketed by multinational companies. 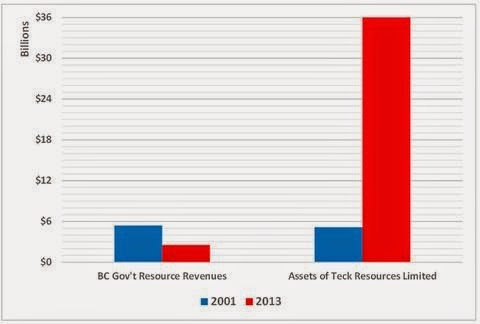 Teck is primarily owned in New York and China so their profitability leaves BC. 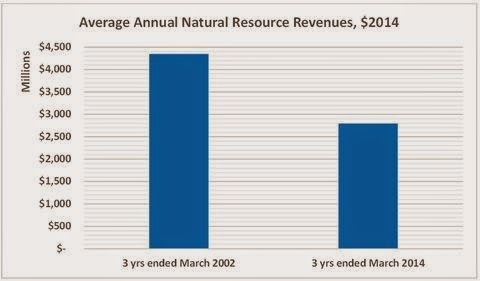 Other large resource companies are also mostly foreign owned. Its not amazing this info is not in the public domain its by design. Hey could we get that petition to have Gregor and Geoff deemed unfit and just switch the names to Christy and Rich ? $100,000 vs 10s of millions it should be a no brainer. If we had those billions in revenue we would have to nickel and dime the public to death to offset the difference. And the 2 billion in carbon tax that the coal industry doesn't have to pay. What amazes me is anyone who votes for the “Liberals” for their so called financial capabilities but fail to actually fact check anything they say. 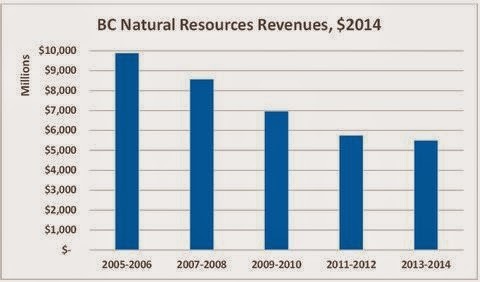 This is arguably the most inept , underhanded and unaccountable government in BC history. How did it come to this. Vote by rote you rubes. Much appreciated Norm. Your work is very valuable in the continuing process of peeling another layer from the spin machine in order to get a clearer picture of reality. It never ceases to amaze me that as a 'some what informed person', i.e. I try to pay attention, articles like this startle me when I realize how much of the crap I have internalized over the past decade and longer. No, what we have is organized crime running the show. I would posit that, based on this government's words, deeds and actions that there should be no 'If' whatsoever at the beginning of the final sentence of your post.